It is time for you to discard every trouble and pressure from the urban rhythm of excessive noise and haste to enjoy the freshest lease from mountains and forests and to take up the terrific challenges of the imposing mountain of Elephant! 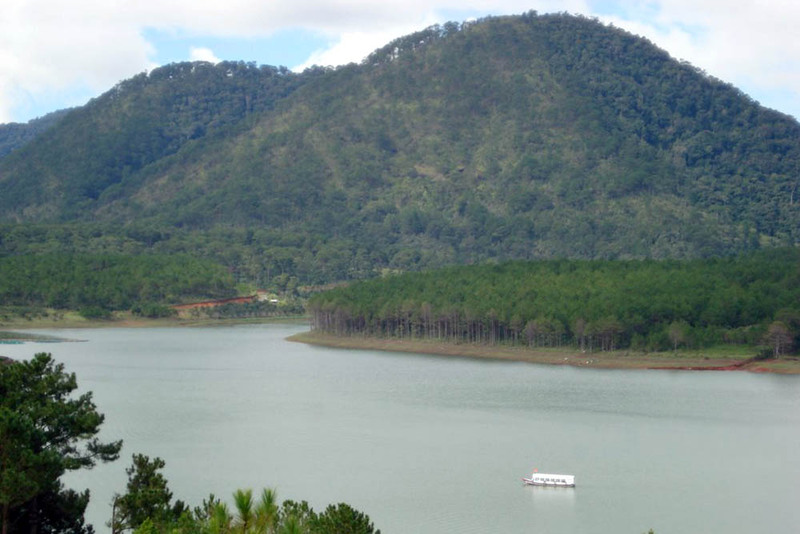 The mountain with special shape of two giant elephants, located right at the southern gateway of Da Lat or 15 kilometers to the south of the city center, is entirely an ideal destination for tourists with great love of nature and adventurous experiences. The mountain range of Rowas (Elephant Mountain today) is legendarily believed to be the embodiment of two elephants from La Ngu Thuong on their way to attend the wedding party of Bian and Lang. When they were climbing Ca Dang hill (Prenn pass at present), they heard of the pitiful death of the young couple. At that anguished news, the two elephant lost their entire strength to overcome the slope and fell to death. Their bodies turned into the today's mountain. Tourists now can easily contemplate from Highway 20 (area of Dinh An, Duc Trong) the obvious shape of the two elephants with their forelegs prostrating toward the pass of Prenn. 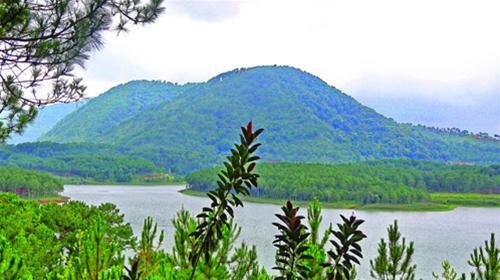 The 100-hectare camping site of Elephant Mountain, lying on Lien Khuong Highway, Hiep An Commune, Duc Trong, Lam Dong and covering totally the right side of the elephants, is appreciated one of the new and most interested destinations across Da Lat and the Central Highlands. Particularly, visitors can join the center of skills training with several exciting team activities and games, such as climbing cobwebs, crossing walls of obstacles as well as overcoming fierce springs, etc., to upgrade certain skills of dealing with difficulties and challenges. As an outdoor camping site, every activity held here is deeply linked to nature. Completing the course of skills training, tourists will be capable enough to participate in the extremely interesting journey to discover the total Elephant Mountain, experiencing valuable moments of enjoying and mixing with the mighty nature. Tourists have several options of routes and means of transports to approach destinations up on the mountain. One of the easiest ways is sauntering along zigzag tracks leading to the village of Darahoa and experiencing special habits, customs and culture of K'ho people, a local ethnic minority. On the other hand, adventurous visitors may prefer another more challenging route of skirting around the hill slope paved with a myriad of dried pine leaves and experiencing first-hand the wonders of Elephant Mountain. The most impressive point of taking this route is the ability to feel vividly the miraculous differences of nature at different heights: small streams lying across the path or unnumbered baskets of forest orchids swinging on century-old trees, etc. If going further, tourists can contemplate in person the over-3,000-year-old Red pine trees, each of which is so large that even three adults' arms cannot surround. The Elephant Mountain is not only a tourist attraction with cool climate all year round and plentiful system of flora and fauna but also is the home to several ancient creatures, especially its unique population of the millennium-old Red pines. 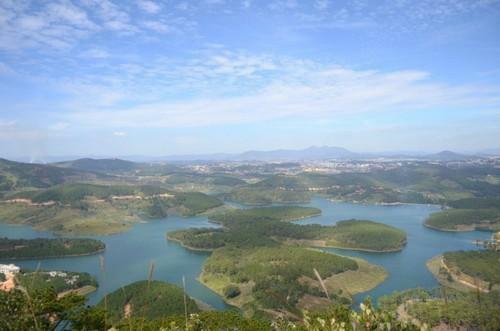 Around 2 kilometers up from the mountain feet is located a surprising limpid lake. Perching on a flagstone at the middle of the lake and enjoying the pure water with your hand will be an unforgettable memory. 500 kilometers away from there is a very steep cliff. However, this challenge cannot raise any difficulty on tourists having completed the training course. Besides, there are always experienced tour guides together with professional equipment to ensure the safety at maximum level. Right above the cliff is Pin Hatt Peak at a height of 1,691 meters, the highest point of the whole mountain. 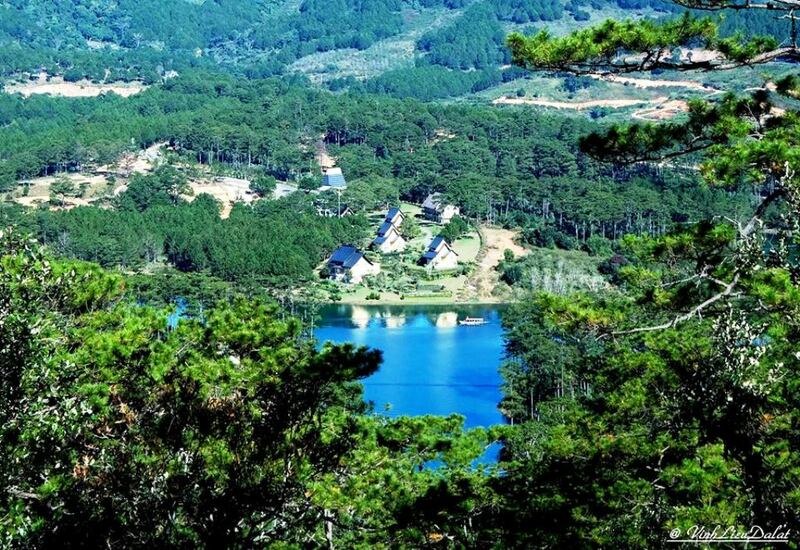 Being here in cloudless days, tourists can enjoy the panoramic view of Tuyen Lam Lake and Da Lat city. Immediately following the conquest of Pin Hatt Peak is the meaningful time for visiting the base area of Elephant Mountain at some hundred meters to the east from the cliff. Here used to be an important revolutionary base of Lam Dong province during wars against the French and U.S. Army. The from-3-to-30-meter sheltered trenches and fortifications of old days have been restored and renewed well to welcome visitors nationwide and worldwide. After an enthusiastic day of conquering the height and enquiring about the local ethnic people's history and culture, tourists will be served a roasted dinner around the flickering camp-fire and among the heady bouquet from jars of Can wine (the local wine of K'ho people drunk through pipes) as well as lively dance steps of K'ho young girls and guys mixing with the characteristic melodies from Gongs (K'ho's specific instrument). 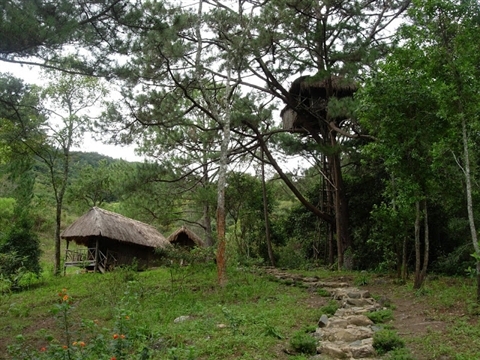 Visitors are free to choose to spend their night at underground rooms within the violet villa or to pitch tents in the center of the Elephant Mountain. For the best convenience, tourists should book in advance to be consulted carefully and picked up. The official price is 30,000 VND/ tourist and 300,000 for one tour guide.